Symbian^3 devices will support DVB-H (Digital Video Broadband – Handset) using a type of headset (shown on the left) that plugs into nokia s^3 devices USB slots. The headset handles call reception and volume in a similar way to other mobile headsets, so you won’t miss calls while you’re watching the game. 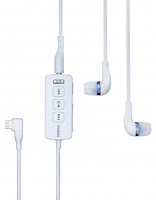 It also features keys for changing channels and music controls for the player on your handset. There’s an app called Mobile TV available for compatible handsets. It’s either pre-installed on compatible devices or it can be downloaded from the Ovi Store. With this, Nokia N8 will truly become a multimedia monster. Imagine now that n8 can hook up into your monitors with HDMI and turn them into a TV. Today, DVB-H services are abandoned. This is replaced by the 1seg from the Japanese ISDB-T standard. The best feature of 1seg is it is free and no need for a seperate transmitter. You can watch easily watch TV without moving the antenna and you can watch in crystal clear pictures even you shake the phone or put it on a vehicle moving 100km/h+. I hope Nokia will market SA phones in the country. Right now, we only have SPB tv (with lots of channels) , Eros Bollywood, India today, E! , Al jazeera available for download. Thanks for the update. I installed the SPBtv application on my phone some time ago, but i can't use it properly, both because poor transmission rate (over 3G) and too small screen (only 2"). I'll try it again when i'll have my N8, over WiFi. yea, spb tv is not recomended over slow 3g/gprs connection. It really needs to be using wifi or fast 3g . its even buffering sometimes on my e71 before using a wifi. As far as i know, in my country we don't have DVB-H services either. But didn't you have one there until recently, Smart MyTV ? Yeah, but its only exclusive to one network (smart) and as the article from yugatech says, its already suspended. Even if they bring back the service, if it will cost the subscribers just to watch tv on their mobile phones then i think it will fail. China phones here with tv are cheap and you can watch local channels for free.. I'm also curious to know how the advertised mobile TV from N8 will work, probably just some internet streams with prerecorded shows. And I have no idea if in my country there will be any such TV channels available.